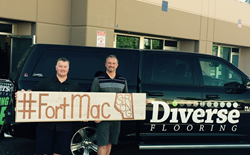 To aid in the recovery efforts from the Fort McMurray wildfires, Diverse Flooring has committed to donate 10 percent of all its profits for the next 30 days to the Canadian Red Cross. “When my brother Shawn and I saw the footage and the images, then heard the stories of those who were displaced with nowhere to go, we felt we had do something to help out,” said owner Todd Farina. The 30 day period begins today and will conclude on June 11. Diverse Flooring is a family-owned and operated flooring store located in Maple Ridge, British Columbia. Since 2004, Shawn and Todd Farina along with the team at Diverse Flooring have been providing high quality flooring products to homeowners all over Metro Vancouver. Working largely with European and North American flooring vendors, Diverse carries a wide selection of carpet, laminate, hardwood, engineered hardwood, tile, vinyl and area rugs in-store.